Overall the gap is almost always bigger for diesel engines. An exciting opportunity exists to investigate the emissions from vehicles and generators on construction sites working with academic, industry and government partners to deliver a scientifically ground breaking and policy relevant PhD. Current emissions inventories estimate that Non-Road Mobile Machinery (NRMM) contributes approximately 10% of the NOX and PM10 emissions within London. However, there is a large uncertainty in this estimate as very few real-world emission measurements have been made of these sources, instead relying on engine test beds and activity estimates have been based on simplified assessments of construction activity. This project aims to address both of these aspects by undertaking state-of-the-art Portable Emissions Measurement System (PEMS) tests on NRMM machinery and utilising the latest information available through London’s NRMM register to assess the fleet activity. An opportunity also exists to test innovative emissions abatement solutions to provide policy-relevant scenario testing for emissions abatement. Has fuel economy started to fall? Average fuel economy has fallen for the first time since Emissions Analytics began its real-world test programme in 2011. Not only that but the ‘gap’ between official figures and our results did not widen last year. The reason for this appears to be intrinsically linked to the introduction of the Euro 6 emissions standards. This newsletter looks to explain what our data is showing and what this means for fuel economy and CO2 targets in the future. Evident in our recently published infographic, pictured above, fuel economy has dropped by 3.3 mpg in 2015 and the ‘gap’ has shrunk slightly from 21.5% in 2014 to 21.3% in 2015. The explanation for this change is due to two main factors, around the mix of vehicles tested and the typical performance of the latest diesel engines. As Emissions Analytics tests vehicles around the time they are launched, there is inevitable fluctuation in the types tested, and hence the mix. This was made more notable with the introduction of the Euro 6 emissions regulations for all new vehicles sold from September 2015. In the run-up to this deadline, the last of the Euro 5 vehicles had a strong bias towards larger, more powerful vehicles, with lower fuel economy. Perhaps manufacturers were concentrating on releasing the Euro 6 versions of their high volume models first, leaving compliance for the lower-selling or harder-to-comply models until the end of the Euro 5 window. At the same time as this mix effect, 2015 also saw a reduction in the average fuel economy of the Euro 6 diesel cars tested. These were on average 5.4% less fuel efficient than the Euro 6 diesels tested in 2014. This is likely to be due to some combination of the mix of makes and models launched and in many cases the additional fuel requirement of the NOx abatement systems. In contrast, Euro 6 petrol vehicles tested in 2015 saw a 5.8% improvement in fuel economy compared to those tested in 2014 – these vehicles did not have extra NOx after-treatment systems. 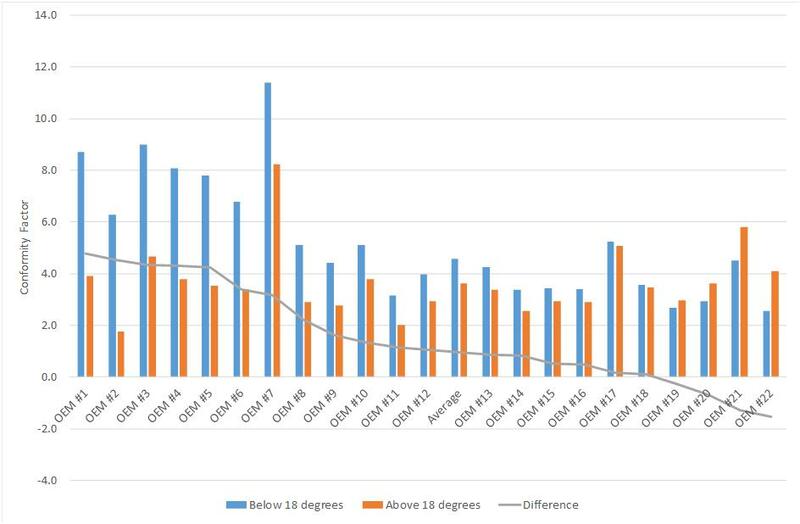 In 2013 we tested just five Euro 6 models, all early adopters of the new technology, which had showed a high average NOx conformity factor, and also a wide spread. In 2014, it appears that well-placed manufacturers brought mainstream Euro 6 models to market with low conformity factors averaging just 2.7. By 1 September 2015, all models had to be Euro 6 compliant, so included model less well optimised after-treatment systems, perhaps driving the average conformity factor back up. What can also be seen, however, is that the recently upheld Real Driving Emissions NOx Conformity Factor of 2.1 from 2017 is readily achievable for many, with 29% of models already meeting this level in real-world driving, according to Emissions Analytics’ database. Do you have practical experience of the maintenance and use of technical equipment? Are you organised, thorough and capable of seeing a project through to the end? This is a unique opportunity to join an innovative company specialising in on-road car emissions testing. Days will be spent installing and de-installing the testing kit, driving a wide range of road test vehicles, downloading, processing and dispatching raw test data. In addition, the successful candidate will be responsible for the maintenance and servicing of the kit, adhering to Health and Safety regulations and working to an exacting test schedule. We are looking for an organised and professional individual who understands the critical importance of robust testing procedures. They must have a technical background which includes some element of machine or car maintenance. They should be confident working with numbers and experience of project management would be an advantage. Although based in South West London this role would include regular extended test driving and some ad hoc travel to clients around the UK and in Europe so you must have a clean UK driving licence. Or call Jane Thomas on 07958 405409 for an informal chat.